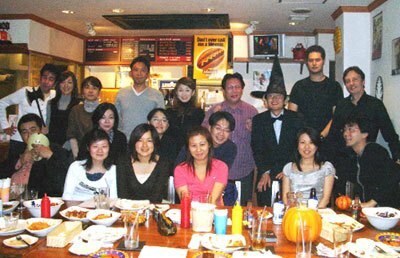 On October 27th the first Smith’s Okamoto Halloween Party was held at “BRATS” Hot Dog Cafe in Okamoto. All together there were 25 attendees made up of students, their spouses and my English-speaking friends. A few people wore costumes appropriate for the occasion. 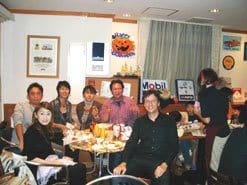 Below Tomoyuki, Mizuko, Sachiko, Chinami, Masafumi and I shared a table and a lot of fun. 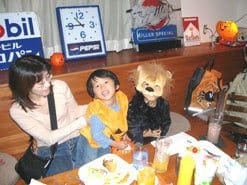 You can also see Rihito just below the clock. Is it really that late already! Everyone enjoyed the fine sausage sandwiches, salad, fried potatoes, a dessert of brownies and ice cream along with a beverage of their choice. 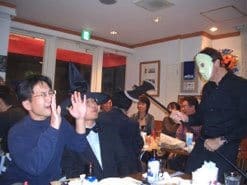 Near the end of the party we sung the “The Twelve Days of Halloween” song together and enjoyed free talking about many subjects. 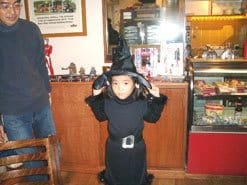 So what costume did I wear? Take a look below and guess. I think my beard looked pretty good. But actually that is my friend, Zoha, from Bangladesh. 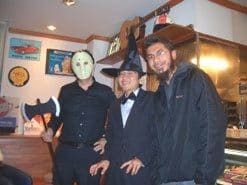 I was the one in the Jason mask.